Home | Articles | Ready, Jet, ECO! While a spa can provide a range of health benefits to its users, these shouldn’t burn a hole in your hip pocket, or come at the cost of our planet. 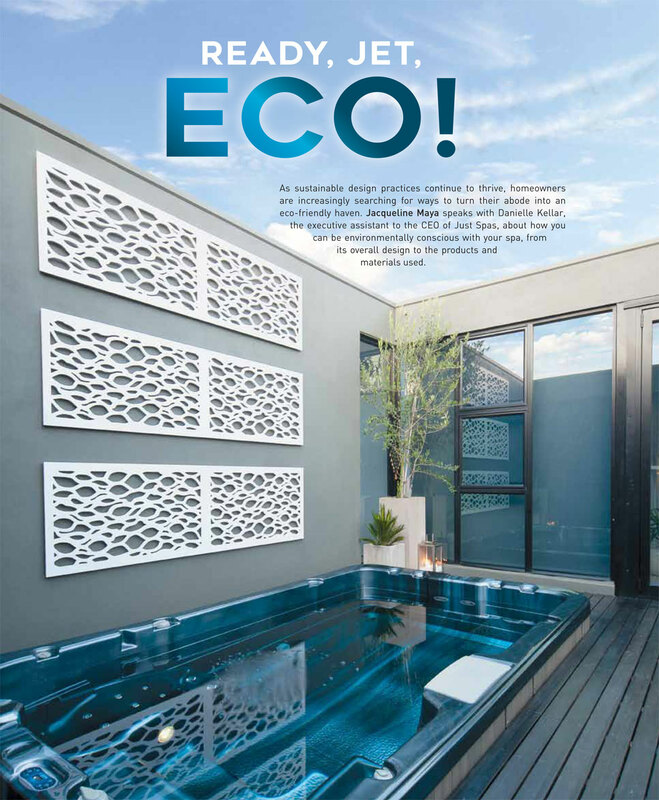 To help you transform your spa into a green retreat, Melbourne Pool + Outdoor Design explores how you can make your spa more ecologically and economically sound, so you can soak in style while reducing your impact on the environment. According to Danielle Kellar, the key benefits of installing an eco-friendly spa involve reduced operating costs, maintenance costs, water consumption, and power and chemical use. “Consumers are becoming more and more conscious of the environment and the running costs of items they are purchasing,” says Kellar. “We find that typically consumers would rather spend more at the time of purchase than have the item cost more to run in the future. “If you purchase an inferior spa or one that hasn’t been designed with environmental considerations [in mind], the life expectancy may be much shorter, and the operating costs will be considerably higher,” she says. “Purchasing an eco-friendly spa will save you money in the long run, [as they generally] have an overall reduced running cost of up to 60 per cent. “If constructed correctly, spas can last up to 20 years,” Kellar adds. With benefits like these, it’s no wonder that eco-friendly spas are making a splash. While there are clear environmental and financial advantages to choosing an eco-friendly spa, there are a few things you should consider before taking the plunge. Kellar advises that homeowners need to think about the associated costs of installing greener heating, filtration and sanitation systems. When making your decision, it’s important to consider your budget now and in the future. If you already own a spa, you can easily reduce its environmental impact by updating its products and materials with eco-friendly alternatives. faster, with a 50 per cent reduction in energy consumption. Mounted under the spa cabinet, the Aquatemp™ heat pump is easily controlled via a touch panel, and doesn’t require on-site plumbing. Using only a percentage of the warm air under the spa cover, the innovative product works well in cooler climates, allowing you to enjoy your spa for longer throughout the year. Similarly, a high-quality sanitation system is also vital to your spa’s health and efficiency. “The Spa Guardian will increase the longevity of your spa water by decreasing the frequency of required water changes,” Kellar says. “Its effective sanitation method eliminates 99.5 per cent of all contaminants in the spa water, which means fewer chemicals need to be added to maintain superior water quality. To ensure these products are suitable for your spa, speak with a spa care professional who can assist you with all your installation and maintenance enquiries. According to Kellar, choosing high-quality materials that have been tested to last the life expectancy of the spa can make all the difference. Investing in a premium hardcover is another sure-fire way to increase your savings. “Maintaining a good-quality hardcover [is key], as old, water-logged covers can increase spa running costs by up to 50 per cent,” she says. A well-fitted spa cover can significantly reduce water evaporation in outdoor spas over summer, while retaining heat in winter, when it can increase the water temperature by up to 15 degrees. Further, covering your spa also means that chemicals won’t evaporate as quickly, reducing the need for additional dosing. Over the course of a year, this seemingly simple item will have you covered, with the potential for massive savings on energy, water and chemical costs. water degradation or penetration, as well as moisture build-up. Its increased density also helps to prevent drafts and mould growth, and regulate temperatures. Energy-efficient LED lights can also significantly reduce your pool’s power consumption, without sacrificing your spa’s visual appeal. 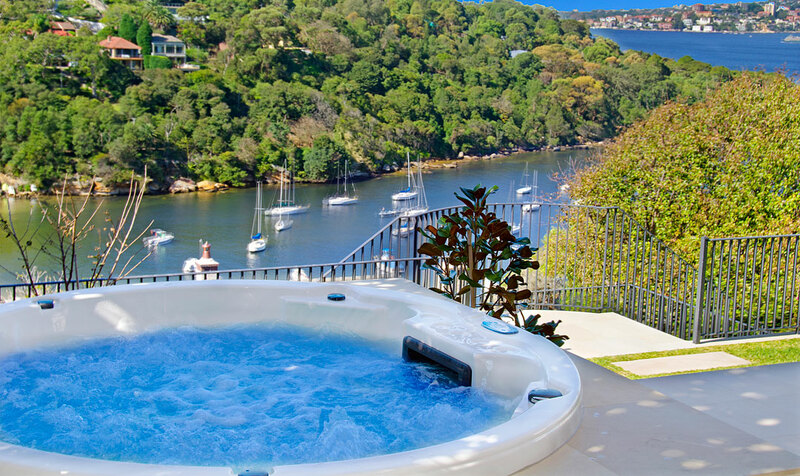 There has been plenty of debate around whether a saltwater or freshwater system is best to use in your pool and spa. From an environmental point of view, Kellar advises that a freshwater spa is the superior choice. Freshwater systems are also generally softer on the surrounding environment. Due to the low salinity of the water, they have little to no detrimental effect on nearby plants and surfaces, which is good news for your outdoor furniture and fronds. Before taking that first soothing soak, Kellar recommends ensuring your spa will have minimal impact on the immediate environment as well. “Noise could possibly be an environmental factor to consider,” she says. “You should ensure the spa is fitted with a low-noise filtration system so it does not disrupt your household’s sleep or your neighbours’. Whether you’re looking to purchase a brand-new eco-friendly spa or simply want to make your existing spa more sustainable, so long as you choose the right products to suit your climate, budget and lifestyle, you’ll be one step closer to greener horizons.